The original piece I proposed was going to be a transformative electronic Bedouin tent located at Al Fahidi Fort in the Al Fahidi historic district of Dubai. But the project was under constant transformation as to where to locate it and the possibility of producing it at all. I participated in ISEA Dubai 2014 with an immersive multiple video projection and sound installation project entitled Interlacing Worlds. As part of the ISEA participation three ISEA artists were offered a one month sponsored residency at Abu Dhabi Art Hub who partnered with ISEA Dubai 2014 and Zayed University who were the hosts of this years ISEA. The other ISEA residency artists were Simone van Groenestijn (Cym) from the Netherlands and Yoshiyuke Abe from Japan, both have participated in ISEA previously. Yoshiyuke Abe was one of the founding members of ISEA, but has now withdrawn from that position and mainly participates in the symposiums. He is a pioneer in visual computer media and computer generated graphics, algorithms and his own hardware and software development dating back to the 1960’s. Cym develops computer games as social interaction and invites kids as participants through workshops. ISEA Dubai happened from October 30th to November 8th, while the residency lasted from October 10th to November 10th. PNEK supported me with a travel grant for the participation. My initial project proposal was actually first entitled Interlacing Worlds – UNIVERSALS, referring to my installation at the 55th Venice Biennale in 2013, and transforming the ideas of perception of space to the idea of culturally and philosophically interlacing east and west. The original piece I proposed was going to be a transformative electronic Bedouin tent located at Al Fahidi Fort in the Al Fahidi historic district of Dubai, based on the shape of a sculpture from my UNIVERSALS series. The semi transparent tent fabric would be projected through so the structure would appear to be, and be experienced as in continuous transformation; the perception of the structure would be experienced as a non-static immersive and sensorial structure. There would be 3-4 projectors placed in the interior as well as speakers. 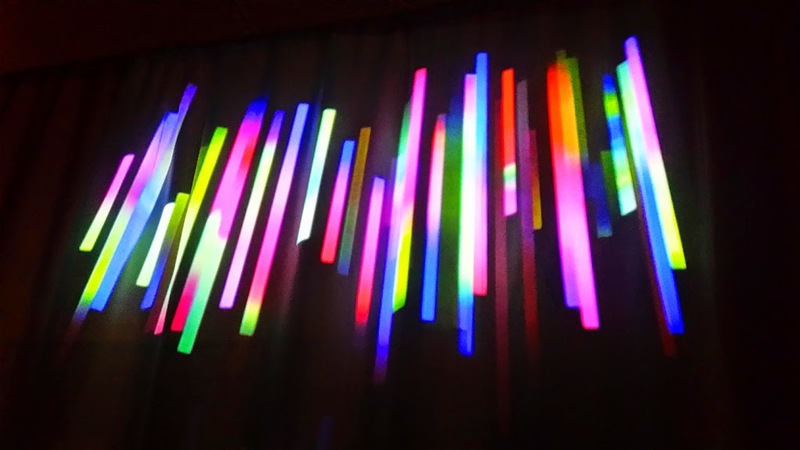 The two video pieces I brought and prepared for this specific installation were Colour Synesthesia VI , 2014, and Sonoptic Parallels, 2014, with sound composed by the legendary electronic sound composer, mathematician and philosopher C.C. Hennix, so speakers and sound quality were an important element of the installation. 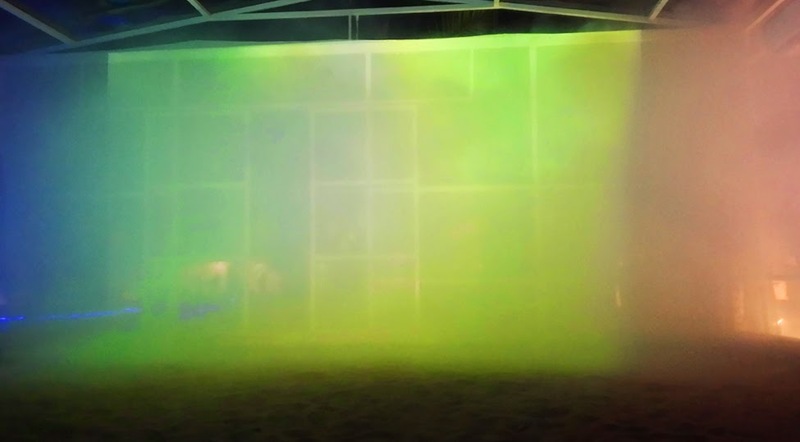 The transformational Bedouin tent would be experienced from both the exterior and interior through color, sound and aroma with the added use of traditional local incense. The interior would also have traditional Bedouin carpets, pillows and seating on the floor, so participants could engage in the use of the structure over time. That was the initial proposal. The curatorial team hadn’t gotten permission from the city nor funding for the installation from their sponsors, so the project was under constant transformation as to where to locate it and the possibility of producing it at all. In leading up to departure from New York to Abu Dhabi it became clear that the last of several offered locations, which was the large Maraya Art Park in Sharjah, was not going to happen for me. So I refocused the whole concept to be located at the Abu Dhabi Art Hub as it became obvious that I could not have a tent custom manufactured and that the residency actually had a traditional tent available I could borrow. One has to be flexible and work with what is available. 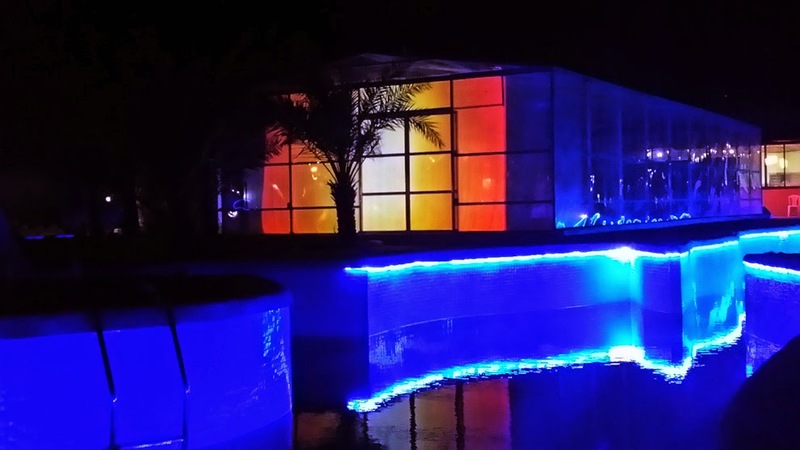 This meant that the whole exterior idea was transformed to purely an interior immersive installation where I could still stay with my concept with the planned projection, sound and interior seating arrangement. In preproduction I tried to secure projectors through the residency, as well as other technical equipment I needed for the set up. The residency had 1 projector available for me and we managed to get hold of another one on loan through the Zayed University branch in Abu Dhabi. This installation was exhibited as part of the Abu Dhabi Art Hub exhibition for the International Art Month including other artists in residency who had been selected through their own internal process. These consisted mainly of painters and sculptors from various countries in Europe. The International Art Month exhibition opened in conjunction with the opening of ISEA October 31st. The installation of my piece was moved to the interior gallery space of the Art Hub building, abandoning the tent and site specificity altogether, but still recreating the interior experience of the tent. The focus was to keep with the initial proposal idea, allowing for projections and sound to be properly represented. 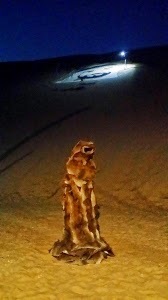 In the first week of the residency I simultaneously became more engaged in what the residency itself had to offer outside of being an ISEA participating artist, which turned out to be quite unique. 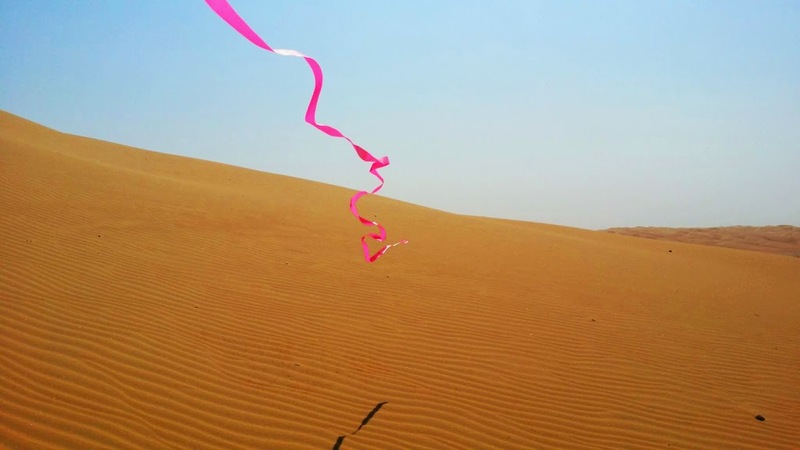 They had a satellite residency in the Liwa oasis in the desert locally named The Empty Quarter, 20 km from the border of Saudi Arabia and bordering Oman. Known to be the largest sand desert in the world and the harshest to cross. 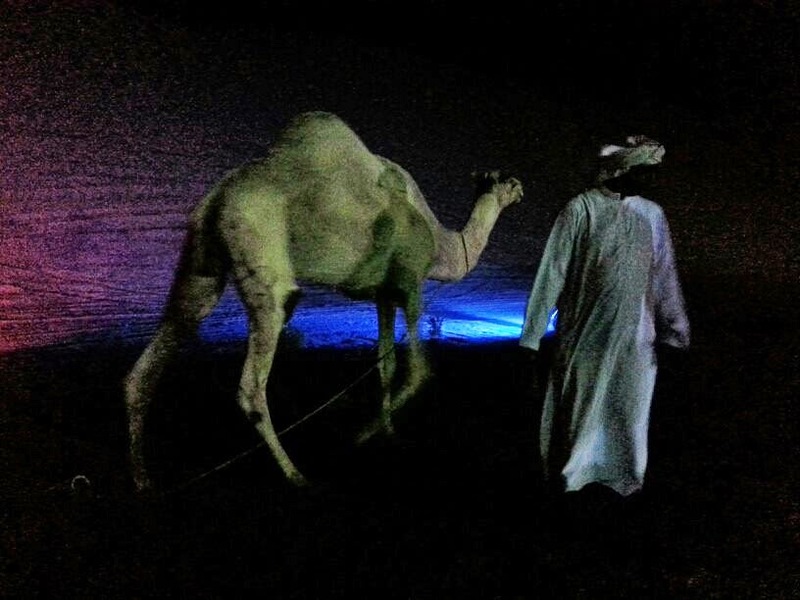 It is also home to the Bedouin and rich in local heritage and history. I decided I would utilize that opportunity to create new work informed by the oasis and desert location, as well as bring my projection installation to experiment with it there and see what could be done. The Liwa Art Hub residency where I spent all in all two weeks out of the 4 weeks in the UAE turned out to be the most enriching and interesting emersion, as well as pleasant since there was not only a swimming pool but excursions out to the desert for sunrise with breakfast in the dunes and late night music and dinners in the oasis art hub. The group of artists in residency there were from Kuwait, Irak, Iran, Hungary, Italy, Germany, Syria and so on and had spent a month there already. None of who work with electronic art, sound or photography. Except for a French documentary filmmaker who was working on a film about the oasis artist residency and the artists. The Liwa artist group was working on an exhibition with the impressive title The First International Historical Memory Art Festival – The Age of Transformation, organized by Iranian curator Nasser Palangi, focused on the history of the UAE from the Bedouin culture to the unification of the Trucial states under Sheik Zayed. I became part of the exhibition without intension and found myself working intensely on a human scale sized burka sculpture made of date palm material, a dual camel bone installation in gold and black referring to the history of oil in the UAE, and I also made a video projection installation for the opening night of the exhibition in a large transparent empty greenhouse with a sand floor using one projector, fabric and a smoke machine, where the fog created a weather condition installation. Sadly the meditative sound composition by C.C. Hennix for the video piece suffered as the only speakers available were karaoke speakers. The exhibition is currently travelling and there is a book being produced from it. There are about 30 artists in total in the show, where the work is interchanging depending on the exhibition location. Back to ISEA Dubai 2014, the foundation ISEA itself is focused on electronic art, symposiums and exchange of information on technology, education, academia and scientific research. According to other participants and also my own experience, the schedule for the smaller symposiums, workshops, talks, exhibitions and meetings were problematic. There were last minute changes, cancellations, didn’t happen, couldn’t be found. There were major problems with information and the website was very confusing to navigate. A lot of the registration information was also lost along the way unfortunately due to technical glitches within the system. The challenge of technical equipment was also a source of production problems for the artists who were invited as singular artists not associated with a sponsoring university or foundation. However most artists I came across I found to be easy going, make the most out of it and go with the flow. It should be noted that everyone was very helpful, friendly, generous with their time and energy, as were the local UAE people I met. In preparation and pre production for site specific and international projects, I find that for installation of any kind of digital and electronic work, being visual or sound, one has to always have additional back up material, hard copies of digital video and sound files like DVD’s and CD’s for worst-case scenarios. I ended up using my PAL DVD’s on basic DVD players. It became clear that digital files are non-compatible with the local equipment when produced on equipment outside the UAE. I’m not familiar with the technical reasons for that, but from what I saw of the various ISEA installations, there were major problems with either the sound or image from video files due to incompatibility. In addition, all participating ISEA artists would have to buy tickets for each workshop or talk which I found strange, rather than be invited as guests in exchange for participating and having come from abroad. The ISEA talks I did go to were courtesy of Abu Dhabi Art Hub as a sponsor of ISEA, at least I said I was a sponsor when entering, coming across as a sponsor and not an artist. Getting between Abu Dhabi and Dubai turned out to be a challenge as well and I couldn’t manage to get to the various Universities and exhibitions with the long distances without a car and enough time. One of the main openings was supposed to happen at Maraya Art Park in Sharjah, and by convincing a local American friend to drive me to the exhibition opening at the American University in Sharjah to the Maraya Art Park, bringing along a lone jetlagged academic from Kansas we found in the hallways at the American University, it started to rain which never happens in that region – so all the site specific electronic art around the park had to be turned off, the opening cancelled and the VIP’s stayed home. This was the main opening gala evening with ribbon cutting. One can’t predict the weather, but a plan B is always advisable especially with site specific electricity run installations. The third ISEA installation I produced in the UAE, was a singular projection onto the exterior of the Al Fahidi Fort building in the historic Al Fahidi district in Dubai. Ironically this location was my first proposed location, which then had been moved to quite a few other potential locations in the whole UAE after the initial no-go for the proposed location. Here fellow Norwegian artist Frank Ekeberg and his partner Krista Caballero exhibited Birding the Future amongst the group of international artists. The Al Fahidi historic heritage district is a touristic neighborhood with labyrinthian quarters, shops, cafes, museums and a library. The small buildings lent themselves well to installations, creating small galleries and projection spaces. But due to the historic nature of the location there was a challenge of electricity, equipment and installation organization. I had initially been given the exterior of the fort walls for my installation, but this was changed last minute the day of the opening to a small side wall within the quarter due to lack of permission. In general the neighborhood exhibition at this location came across well for the artists and what we had to work with. In the end, the hosts are not to blame for the multiple technical, organizational problems and confusion, but rather the system of the organization itself could be run better. It was a very large endeavor to take on for this years hosts having not had any kind of electronic art happening on this scale before in the region. The ISEA artists I came across and spoke with out of the over 170 participants and who mostly seemed to be returning artists, enjoyed the reunion, commeraderie, seeing and experiencing new parts of the world, exhibitions and exchange of information and knowledge. 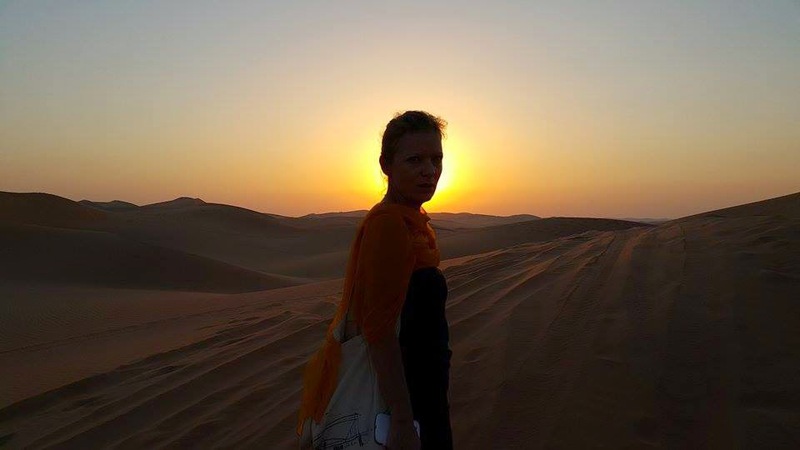 Having created a large body of new work during the residency, experienced the oasis and desert, and gotten to know people from the middle east and locally in the UAE has been the reward.